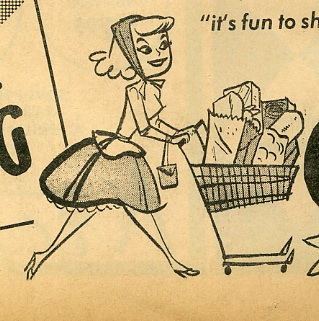 Remember when the supermarket was fun??? When there were free tastings on every aisle and pushing the trolley provided an inordinate thrill? Alas those days seem long gone, 20 years later and paying for my own groceries, the supermarket is where I head for boring basics, BOGOFs and cheap booze. So where to look these days for foodie shopping thrills? Why the ubiquitous farmers market of course! Now I know this idea is nothing new – I’ve been swinging my eco bag full of sourdough, Comte and venison sausages as long as the next person. But, the goodthing about the ridiculous price of groceries in Sydney is that it means shopping at the local farmers market is much of a muchness price wise so you may as well grab your hand woven Moroccan basket (Oh and maybe a dog and a pair of Wayfarers), bypass Coles and Woollies and head down to your local market. You will not be disappointed, and I can guarantee the coffee be better. Last Saturday I left behind the supermarket shiny floors and noisy plastic bags and headed what I’m told is one of Sydney’s best – Eveleigh Farmers Market, where you can pick up local fruit, vegetables and meat galore straight from the farmer, a cheese tray of delicious Australian fromage for $10 and my favourite bargain a tray of organic eggs for $5. Remove the giblets from the chicken if they are in there and run your chicken under cold water to wash and then pat dry with a towel. 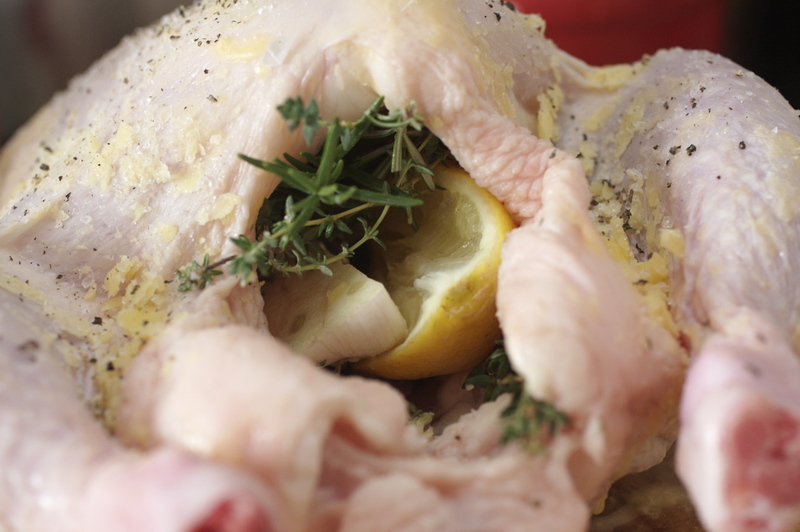 Smother your bird in butter or olive oil and season generously with salt and pepper.Fill the cavity with a lemon chopped in half, a head of garlic chopped and a bunch of thyme or any hard herbs you may have. Cross the legs and tie them closed if you have string, I’d run out the day I did this so my bird was a little loose…still delicious though! Put the chook in the oven at 220c for 10 mins then turn it down to 180 and cook for about an hour and 20 mins depending on the size. I usually do 10 minutes on high and then reduce to 180c and cook for another 20 minutes for every 500g of bird. 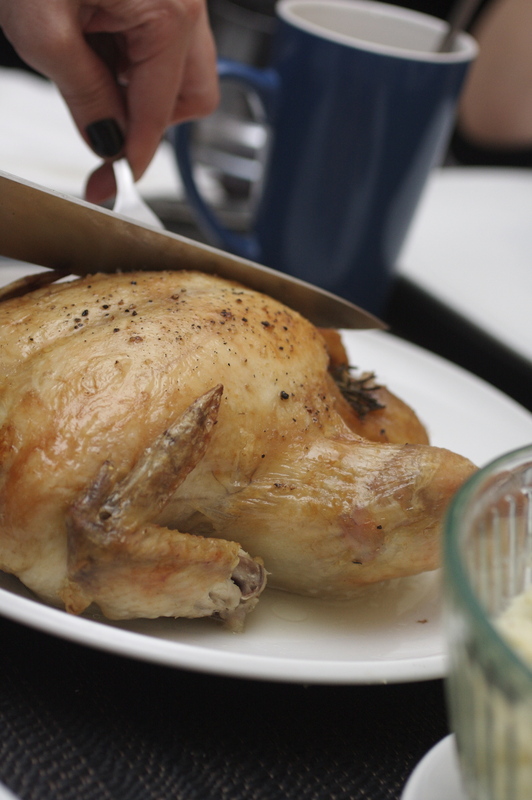 You can check it’s cooked by sticking a knife into the crease by the leg, if the juices run clear it’s cooked. 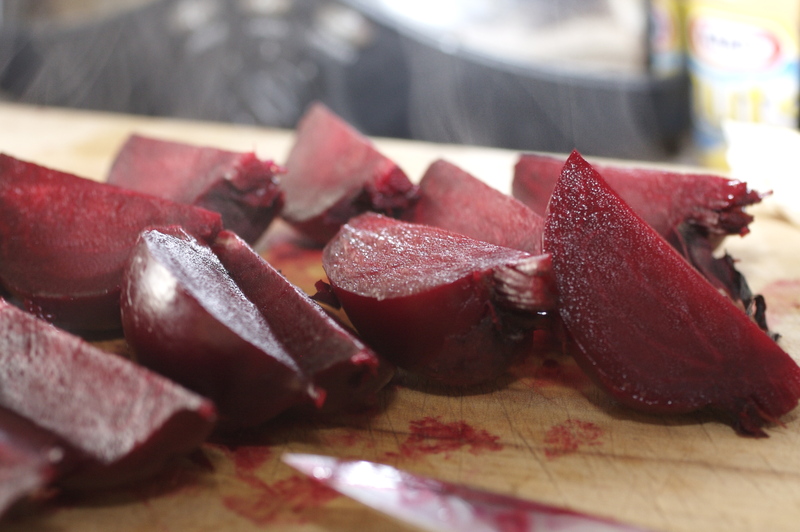 So easy – cover the beetroot with cold water and boil until soft enough for a knife to go through (usually about 25 – 30 minutes). Drain and leave for a few minutes then peel them easily by donning a thick pair of Marigolds and rubbing them – the skin will slide off. Cut up into quarters, sprinkle over some oil, salt and pepper and put in the oven at 180 – 200c and roast for about 30 – 40 mins. Also if the leaves on your bunch are nice don’t throw them – you can eat them like you would chard. I blanch mine and put them in beetroot risotto before serving. Even easier – Turn your oven onto 180c. 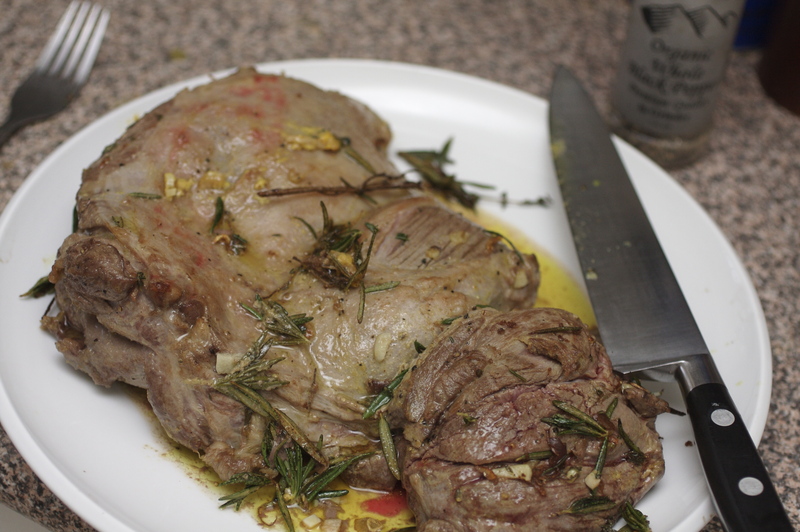 Just rub the lamb with whatever you have in your cupboard – mustard, garlic, oil and salt and pepper are ideal. A few sprigs of rosemary will be exceptional. Leave it for as many minutes as you can and then pan fry it in a big pan to seal and pop it in the oven for 20 minutes if you like it very pink and anything up to 40 minutes should be good for a more medium audience. Anyone else got great market recommendations or recipes? Eveleigh Market is held every Saturday ‘rain, hail or shine’ as it is located under the heritage listed Blacksmiths Workshop. Thanks Joy – let me know how you get on! 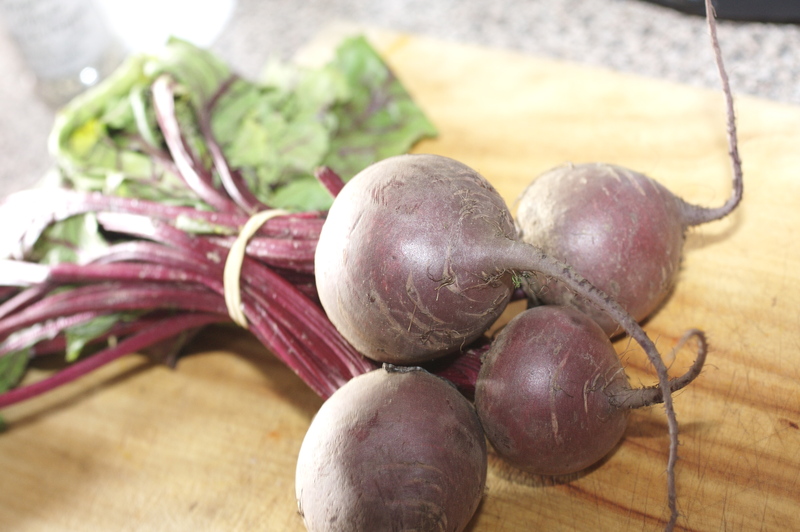 Does’nt that roast beetroot remind you of your Father’s kitchen! It does! And I need to make his carrots & parsnips soon too…I miss them!